If pink blueberry bushes seem to you like something out of a Dr. Seuss book, you aren’t alone. Plenty of people haven’t experienced pink blueberries yet, but ‘Pink Lemonade’ might be the cultivar to change all that. 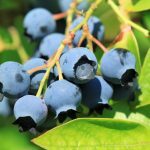 Read on for information on growing pink lemonade blueberries and harvesting pink blueberries. Pink blueberry bushes with pink fruit are not a fantasy. In fact, pink blueberry plants have been around a long time. The cultivar ‘Pink Lemonade’ was developed by the U.S. Department of Agriculture some 50 years ago, but nurseries were sure people wouldn’t like pink berries on a blueberry plant and the bush went nowhere fast. But ‘Pink Lemonade’ is staging a come back as gardeners increasingly want blueberries for their cancer-fighting antioxidants. And no cultivar deserves it more. It is truly an ornamental shrub, with pretty spring flowers and color-changing berries that ripen into a deep pink in autumn. 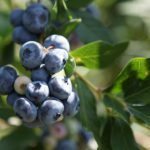 Blueberry varieties are generally divided into four types: northern highbush, southern highbush, rabbiteye, and lowbush (a groundcover species with small berries). ‘Pink Lemonade’ bushes are the rabbiteye type of berry. Rabbiteye berry bushes are fairly compact and require fewer cold hours to set fruit than other species. ‘Pink Lemonade’ stays under 5 feet tall and only needs 300 hours of temperatures under 45 degrees Fahrenheit (7 C.) to produce. 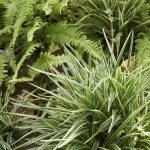 The foliage on ‘Pink Lemonade’ plants isn’t pink at all. It grows in a silvery bluish color in the early spring. The leaves turn yellow and red in autumn, staying on the bushes deep into the winter. The attractive yellowish-red twigs provide winter interest. The flowers on these pink blueberry bushes aren’t very pink either. In spring, ‘Pink Lemonade’ bushes produce bell-shaped white blossoms. These stay on the shrubs most of the summer, until the plant begins to set fruit. The fruit of pink blueberry plants grows in green, then turns white and light pink. The berries mature to a lovely shade of dark pink. If you fall for the many charms of ‘Pink Lemonade,’ plant these blueberry bushes in a site with full sun. Although they grow in partial shade, the plants won’t give you much fruit. 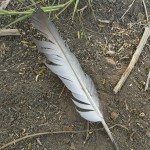 Choose a site with acidic soil that is moist but well drained. The pink blueberry plants are hardy to USDA Zone 5 and warmer. 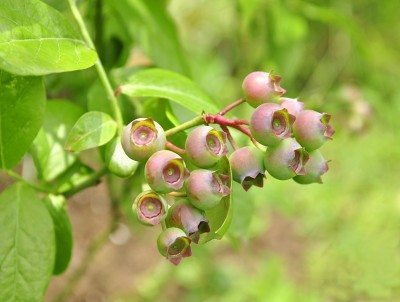 Some blueberry plants set fruit all at once, but that isn’t the case with ‘Pink Lemonade.’ It begins to set fruit mid- to late summer, producing one large first crop, then fruiting continuously through October. Mature fruits will be bright pink in color. ‘Pink Lemonade’ is twice as sweet as ordinary blueberries, which makes it delicious right off the bush. The berries are also great in desserts.